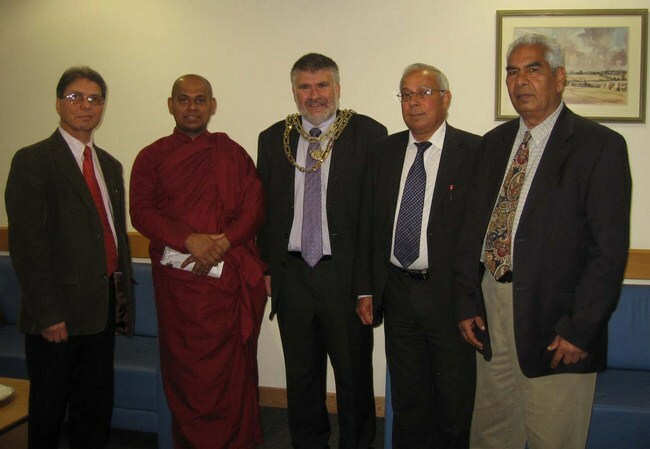 The Worshipful Mayor of Bedford Borough Council Mr Dave Hodgson hosted a Special Celebratory Reception at the Bedford Borough Hall Council Chamber on Tuesday 12th June 2012 at 7PM to recognise and appreciate the contributions of the Buddhist Community in Bedfordshire, under the leadership of Venerable Akurala Samitha, head monk of Letchworth Dhamma Nikethanaya Buddhist Cultural Centre. This reception facilitated opportunities to improve the relationship between local authorities and community members (Buddhists, Sri Lankan, Indian, Meditation & Spiritual Groups etc). The Worshipful Mayor Mr Dave Hodgson was first elected Mayor in October 2009. He is a Liberal Democrat, and prior to becoming Mayor he was a Councillor for the Kingsbrook Ward from 2002. 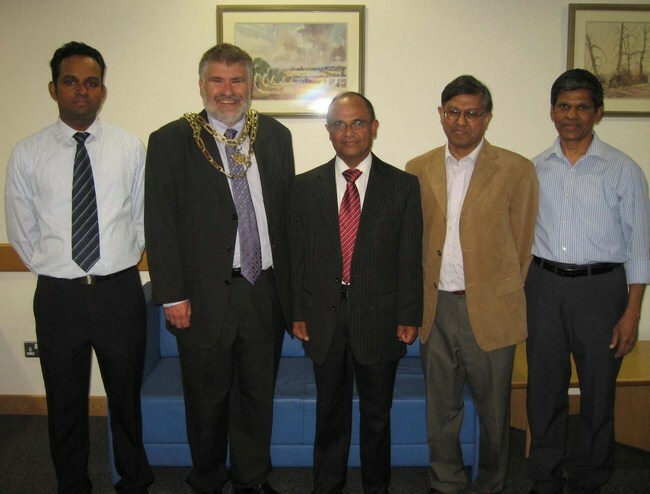 He was re-elected in May 2011, and his current term of office as Mayor is until May 2015. 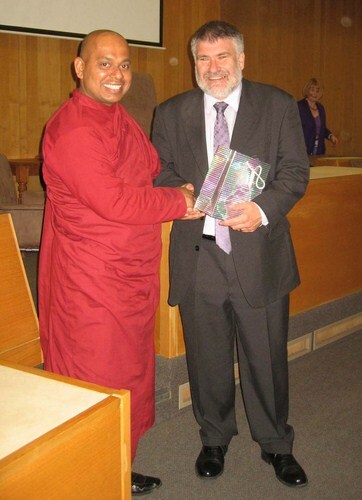 In honour of Venerable Akurala Samitha, His Worshipful Mayor appointed him to chair the Chamber Meeting. Buddhist community was extremely humble for the privilege given by His Worshipful Mayor by hosting the reception in the Chamber itself, which was a rare opportunity. His Worshipful Mayor welcomed the gathering and appreciated contributions to the community. Venerable Akurala Samitha also gave a speech explaining his involvements in the community service. 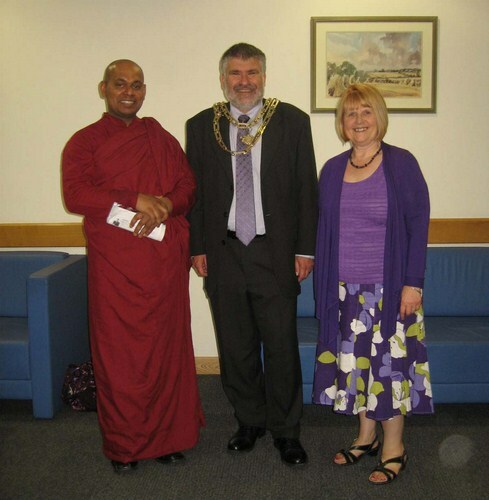 Mr Aruna Weerasinghe explained in brief about Buddhism and the existence of Buddhist Community in Bedfordshire. Mr Arun Kumar delivered a short speech on behalf of Indian Community explaining the history and existence of Indian Buddhist Community in Bedfordshire. Representing English Community, a member of Letchworth Dhamma Nikethanaya Buddhist Cultural Centre Mrs Cheryl Green explained the benefits of the Letchworth Dhamma Nikethanaya Buddhist Cultural Centre into a wider spectrum of Bedfordshire Community and deeply appreciated Venerable Akurala Samitha’s incredible devotion and hardworking dedication in visiting schools, nursing homes and doing many more other services. Eventually his Worshipful Mayor and the Community members had a great opportunity to meet each other and discuss many issues for a better society whilst enjoying a wonderful refreshments time. A large number of community representatives were attended by invitation to the reception. It was encouraged to host annually.